Staying in San Jose and looking for a family friendly way to explore the central valley of Costa Rica? If you are a horse lover, one of our San Jose horseback riding tours should do the trick! Since San Jose is pretty much in the center of Costa Rica, whichever direction you choose there is a completely different eco-system to explore. One of our top selling horseback riding tours in San Jose takes you out to explore the 2000 acre ranch Hacienda Pozo Azul in Sarapiqui. The drive alone takes you through the Braulio Carillo National Park which is breathtaking in itself. Once at the ranch, your horseback riding tour takes you through the Sarapiqui River and other small tributaries as you let your horse guide you through the lush rainforest found here. Combine your Sarapiqui horseback riding tour with a canopy tour and you have one memorable vacation experience in Costa Rica to last a lifetime! 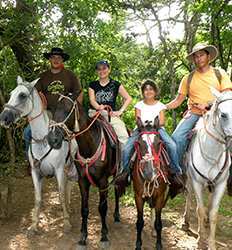 If your family all has different ideas about what they want to do on their Costa Rica vacation, our horseback riding tour at the San Lorenzo Adventure Park is your best bet. Combine your horseback riding tour in the cloud forest with a canopy tour, canyoning circuit, Tarzan swing, river rafting or just hang out and enjoy the hot springs and other amenities at the Lands in Love resort. Your options are just about unlimited at this incredible adventure park in Costa Rica. So what are you waiting for? Venture out of San Jose and into nature on one of our San Jose horseback riding tours. Choose from exciting Horseback riding & zipline combos, or combine your horseback ride with a relaxing day at the spa. Pick from our San Jose horseback riding excursions below then saddle up and ride off into the horizon! Allow us to whisk you away to the Hacienda Pozo Azul where our Sarapiqui Canopy and Horseback Riding adventure combo begins! From two perspectives: the thrilling zip lining fun of a canopy tour way up high, and the quiet peaceful serenity of the forest floor on a horseback tour all in a super one day tour from San Jose. 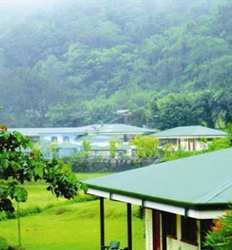 In the heart of the San Lorenzo Cloud Forest lies the Lands in Love Adventure Park. A complex of 280 acres, it encompasses true beauty and a myriad of fantastic tours that you can choose a-la-carte to design your own adventure! Choose your adventure combo today!